There are many options on the market to help you filter and soften the water in your home. There are a lot of options out there to filter the water in your home as well as soften it. Hard water is a big problem in the Phoenix area and for many homes it is more than a nuisance, hard water can damage plumbing pipes and plumbing fixtures. Robins Plumbing, Inc. offers solutions ranging from whole home filtration systems to just having clean purified water at your kitchen sink. We are here to educate you on your options so you can make an informed decision that is right for you and your family or business. Whether you’re looking for a traditional salt water system to soften your water or you’re looking into other options to help soften your water like citrus based systems we have you covered. Softening your water can extend the lifetime of your plumbing fixtures by years by reducing sediment build up. This equals big savings over the lifetime of your system. Softening your water from hard minerals isn’t always enough, that’s where filtration can really make a difference in the quality of water in your home or business. 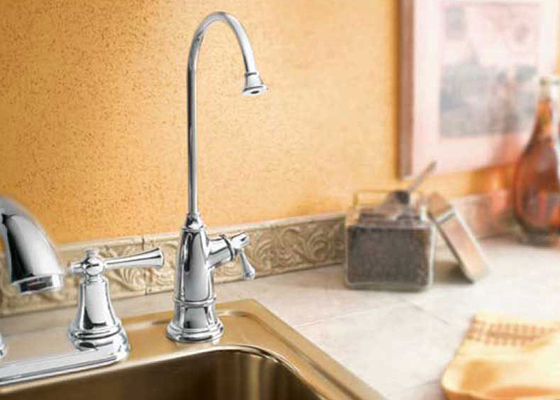 Imagine having great tasting water from every fixture in your home. We’re here to help, call today to schedule a consultation with one of our team members. If you’re ready to upgrade your water system, get in touch with the team at Robins Plumbing, Inc today. Our plumbers understand the unique challenges of the Phoenix water system, and we offer a wide range of solutions to help. We specialize in Nuvo Water Systems, Nuvo Home Systems, Nuvo Manor Systems, Nuvo Studio Systems, and NuvoH20 Complete Systems. We also offer residential and commercial plumbing services such as drain cleaning, water heater repair and installation, commercial and residential jetting services, faucet repair and replacement, and much more. If you have any questions about our local plumbing company or you’re interested in learning more about our plumbing services, contact our professional staff today.